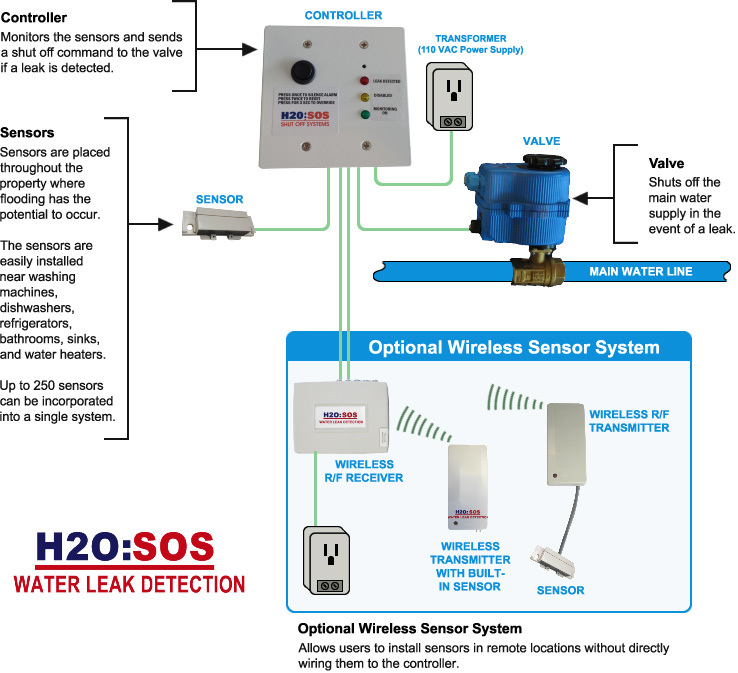 The H2O SOS water leak detection system can be installed by a homeowner with basic plumbing and electrical experience. Alternatively, you can choose to hire a general handyman, plumber, electrician, security alarm system installer, or other contractor to assist you with all or part of the installation. For do-it-yourself projects, the wireless configurations allow for the easiest installation and may be preferred to the hard-wired options (especially in homes or businesses where it may be difficult to run wiring to each sensor location). Each H2O SOS system is composed of a control panel (controller), a plug-in transformer, the water shut-off valve, and at least one leak sensor. The diagram below shows a common installation. The H2O SOS controller is designed to be mounted over a standard 2-gang electrical outlet box and is powered by a 24 volt plug-in transformer (provided). The transformer plugs into a standard electrical outlet. All wiring is done with standard 18 gauge (2 wire) low voltage wiring. This is the same wiring that is usually used for thermostats and doorbells. The H2O SOS system can support and monitor up to 250 sensors; however, in most applications, you will use between 5 and 20 sensors. Sensors are generally located at the base of walls throughout the home where leaks would be most likely to occur, such as near the hot water heater, behing the clothes washer and dishwasher, behind toilets, and under sinks. The closer the sensors are located to potential leak sources, the faster a leak will be detected and the sooner the water will be turned off. If hard-wired sensors are used, the same low voltage wire is used to connect each sensor in a parallel circuit to the control panel. Wireless accessories are available for applications where running wire may be difficult, impossible, labor-intensive, or costly. For wireless applications, the controller must be wired to the power source, shut-off valve, and a wireless receiver. Wireless transmitters then send the leak signal to the receiver from the sensor location. For convenience, we have wireless transmitters with built in sensors, or you can also wire one or more standard sensors to one of our standard wireless transmitters (sensors in the same room share one transmitter). Each receiver can support up to 32 transmitters and each transmitter can support up to 25 sensors!